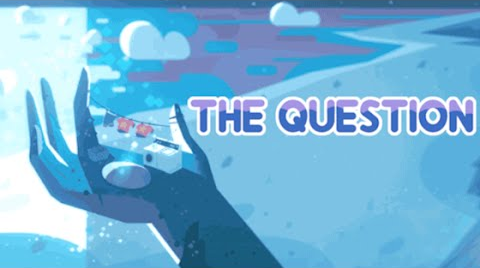 Not surprisingly,so far I’ve really loved this week’s Steven Universe episodes, and “The Question” is no exception. While much of it wasn’t quite what I expected, it delivered some really great messages (as per the usual with this amazing show). Yesterday’s episode, “What’s Your Problem”, ended with Steven and Amethyst finding Ruby and Greg hanging out, and when they first approached at the beginning of “The Question”, Greg and Ruby were talking about Rose Pink Diamond. They both seemed to be fine with the whole situation, and while I know that’s not out of the ordinary for Greg, it still surprised me that he brushed it off as, well, flippantly as he did. As for Ruby, she was of course upset when Sapphire forced them to unfuse, but talking to Greg obviously helped. Unfortunately, it didn’t help the way Steven wanted it to, because “The Question” kicked off with Ruby observing that it was the first time she’d ever really thought about herself and what she might want. I personally loved her little speech about how she’d always been WITH someone – first other Rubies, then Sapphire – and that she’d suddenly realized that she didn’t HAVE to be Garnet. She could be on her own. Now, if you’re reading this article I’m going to assume that means that you’ve watched the episode, because I’m going to jump ahead and mention that yes, I know that Ruby chooses to continue the relationship that is Garnet; however, the first half or so of “The Question” was a really great showcase of both the emotions of a person who has rarely (or never) been alone suddenly finding themselves that way and the way friends and family should react following the separation/breakup of a two people who they love being together. So Ruby was ready – or at least trying to be ready – to take on life by herself, and when she said as much both Greg and Amethyst were, well, totally okay with it. And even though Steven freaked out at first (who wouldn’t freak out when facing the incredibly depressing thought of not having Garnet around ever again??? 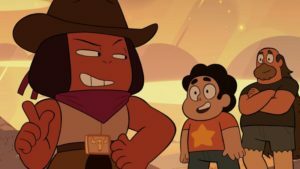 ), when Greg explained that if Ruby didn’t want to be Garnet, that would be what Garnet wanted as well, Steven decided that he would support Ruby on her “quest for emotional growth”. As someone who has spent the majority of her adult life in long-term relationships, I remember feeling things so similar to the way Ruby explained herself in this episode – as always, SU is just so dang relatable, while at the same time teaching lessons that I have to assume it meant to teach: mainly that you should support your friends/family when they are experiencing things like this…no matter how much you liked them in that relationship. Of course in this case, Ruby and Sapphire ‘got back together in the end’, so to speak, but that doesn’t always happen. I’m telling you, if you are watching good friends or family members going through a breakup that you don’t want to happen, you need to watch the first seven minutes of this episode. Okay, I think that’s enough digressing! Because not only was “The Question” amazing for all of the things I’ve just mentioned, it also featured a great song (even if it was very country-music-ish, and I am not a country music fan), a hilarious plot point featuring Amethyst as a horse, and at the end, A PROPOSAL! That’s right, Ruby and Sapphire didn’t JUST get back together – Ruby asked Sapphire to MARRY her! Add another plus to a show that has already been great for representation, because it sounds like we’re going to get a WEDDING to boot! Sorry not sorry for all the caps; I really am THAT EXCITED, and I cannot WAIT for the wedding. I have to imagine all SU fans are in the same boat. Did you have any thoughts about “The Question”? Let us know in the comments! Previous:Should Calling Off The Wedding In Batman Issue 50 Matter?